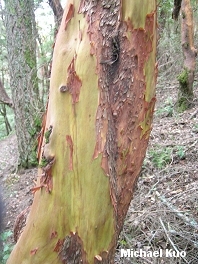 West-Coast hardwood with dark green, shiny leaves; bark distinctively peeling away into papery scales; distinctive orange berries. 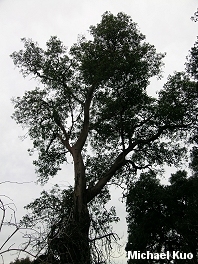 Habitat: Sometimes in pure stands, but often mixed with other trees; in a variety of forest types; limited to the West Coast. Stature: 20-100 feet high; to 4 feet in diameter; with a rounded crown. 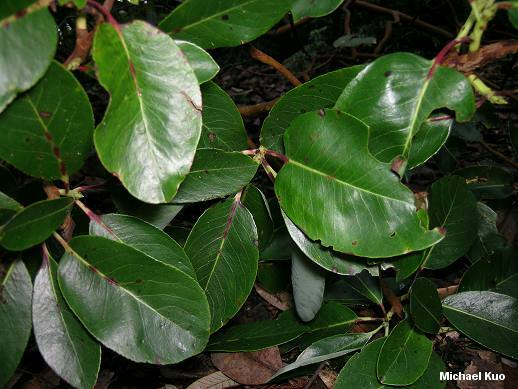 Leaves: Evergreen; leathery; 3-6 inches long; unlobed; not usually toothed; dark green and shiny above; paler below. Bark: Thin; reddish brown; separating into papery scales that peel away to reveal the inner bark. 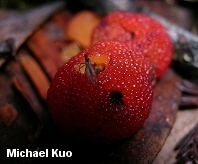 Fruit: A round, orange berry up to half an inch long. Amanita lanei; Entoloma bloxamii; Leccinum manzanitae; Mycena madronicola; Tapinella atrotomentosa; Tricholoma pardinum; Tricholoma saponaceum; and many others.